This year we have seen more Hummingbirds coming to our feeder than ever before. After seeing a few different species at our lone little feeder, I went out and bought few more. 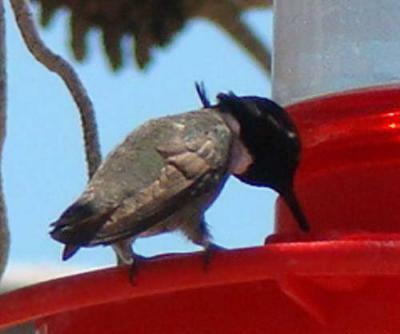 The other day I saw a little Costas Hummingbird at one of them. I was so excited! Silly me. Came right in and identified it. What a cute stumpy lil' thing. So differently shaped than the others! I know this is an extreme close up, but I just wanted to share with others, their cute little shape. I've only got one picture of him in the air, and its not a real clear one, I can't wait to get a good shot of him. His little neck is so brilliantly colored. The other day, I learned NOT to wear a real colorful flowery shirt, while sitting out there enjoying their visits! The female Rufous came right up to me, and tried to land on my shoulder! She was doing 360's all around me! Almost landed on my camera, and then my arm!! It didn't take long for me to realize what she was doing! It was a unique experience to say the least. Now if I could just get this little Costas to sit pretty and perched nearby a feeder, facing me!!! Or capture him in flight! My place has to be the one stop candy shop to them! Yipee for me! Don't forget to clean your feeders! Actually.. the flowers on my shirt were a dusky purplish color!! Not red at all. They were on vines of green with leaves. So I am sure that it was confusing for the sweet little thing. They are so bold. But I do know that they will go after red stuff big time. I've seen them do it to the children's toys on the patio. Just checking them out, in case they were a source for them. My feeders are all red.. but my flowers are up now, Scarlet Salvias' and Fushcias ( which are bluish purple in color, along with the pink) and they will gather from those flowers all day long. How wonderfully tender hearted for you guys to have painted over your wall paper!! I would have done the same thing, for sure. I have since gotten even another new HB visitor! It is the Calliope! When I read that they are in higher altitudes and mountain ranges, that explained it. So exciting to watch, all these little Hummers. Hummingbirds will go after anything that is red. At my parents' house, the kitchen wallpaper had big brightly colored flowers on it and many of the flowers were red and thus attracted the hummingbirds and caused the birds to fly into the window because they were trying to get to the flowers on the wallpaper. The hummingbirds seemed to think the flowers in the wall paper would make a great food source. This happened so often that we finally painted over the wallpaper as a way to try and ensure the birds would stop flying into the window.